This is a Vitis riparia Michaux selection. - long brown colored shoots with an absence of flat-lying and upright hairs. Riparia Gloire de Montpellier has very high tolerance to radicicolae grape phylloxera. It is likewise quite tolerant to Meloidogyne hapla nematode infestation but its resistance to Meloidogyne incognita and Meloidogyne arenaria nematodes is just moderate. It has a certain degree of tolerance to Agrobacterium vitis. This root stock is adapted to acidic or decalcified soils. On the other hand, it appears very sensitiev to chlorosis and resist to less than 15% of total liestone, 6% active limestone with an IPC de 5. It adapts well to humidity but is sensitive to drought and appears poorly adapted to soils which are too clay or compact. This root stock easily absorbs potassium and absorbs magnesium more difficultly. It may thus display magnesium deficiency, black stem and less acidic musts may be obtained. Gravel and fairly fertile soils should be privileged for this root stock with conditions allowing to ensure sufficient water levels. Poor, dry or superficial soils should be avoided. Radical growth of the trunk of this root stock remains limited. It is said that it has "a thin leg" which may cause iportant differences in diameter with the grafts and may require a training system. 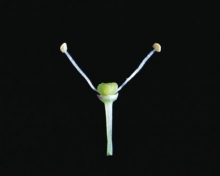 The young plant development is good. Riparia Gloire de Montpellier graft vigor is very low and plant development of vine trunks is reduced. Riparia Gloire de Montpellier is favorable to floral initiation but given its very weak vigor, the yields obtained are generally limited. There is an influence on an early plant cycle and under adapted conditions, with sufficient plant density may produce quality products. Tis root stock has a high affinity for Cabernet-Sauvignon N, Chardonnay B, Chenin B, Cot N, Gros Manseng B, Merlot N, Sauvignon B and Tannat N.
Wood production is good (40 000 à 80 000 m/ha). The internodes are long with average diameter. 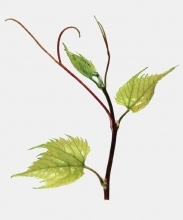 The growth of quick buds is limited and the vine shoots with few branches. This root stock has good propagation by cuttings and grafting properties. 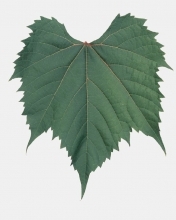 Riparia Gloire de Montpellier tolerates gall phylloxera moderately well and resists well against downy mildew. The 5 approved Riparia Gloire de Montpellier clones carry the numbers 1, 142, 186, 1030 and 1162.